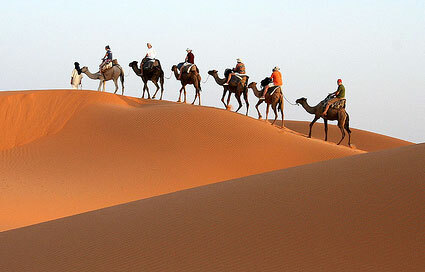 Day 1 - Marrakech: Arrive at Marrakech airport and transfer to the hotel or raid. We have dinner, then off to bed. Day 2 - Marrakech - Ait Zitoun (900m): Transfer to the foothill of the High Atlas Mountains, around 40 minutes drive where we will meet our guides and mules. On the way we see rich farming of cereals and barley. Arrival to Ait Zitoun, a Berber Village situated in Haouz, known for it's olives trees. (Around 3 hours of walking). We will have lunch on the way. Dinner and accommodation in a Berber guesthouse. Day 3 - Ait Zitoun (900m) - Ait Hmad (1400m): After breakfast, we continue towards the Tizgui Village, from where we will appreciate the nice panoramic view of the Haouz plain and the Amizmiz Region. We will cross the Ait Ahmad pass where at its feet we will discover farms and the villages at mountains flank. (Around 5 hours walking). Lunch will be on the way and overnight in a Berber guesthouse. Ait Ahmad, a village constructed with clay and stones, in the middle of mineral landscape at 1200m altitude. This village has about 200 inhabitants. Life is based essentially on irrigation, farming fruit trees, cereals, legumes and animal breeding. 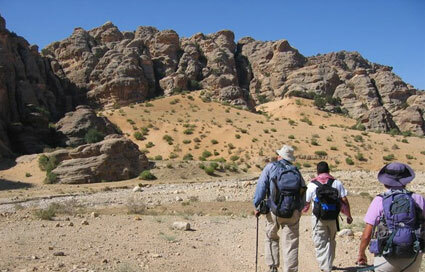 Day 4 - Ait Hmad (1400m) - Imi n'Talat (1500m): We continue on the left bank of Amizmiz River. 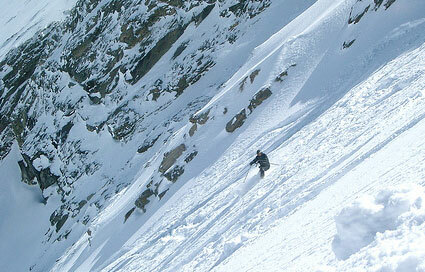 We will discover the local life style of the Berber villages. We cross traditional agriculture, pastoral life and women workshops. We will arrive in the middle of the afternoon to the Berber guest house where we will take a Moroccan bath (Hammam). We will also discover the traditional bread making at our hosta's house. Lunch on the route and dinner in the Berber guest house (Around 5 hours walking). Imin’Tala, a large Berber village situated on a mountain flake and exposed to the right bank of the Amezmiz valley, which provides this village with a rich agriculture. Unfortunately none of theses villages have electricity or running water, but the inhabitants hospitality remains legendary. 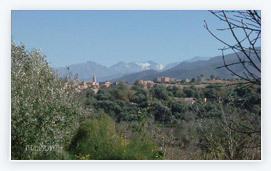 Day 5 - Imin’Tala - Forester house - Marrakech: Berber villages and valley of the Atlas Mountains (around 4 hours walking). Diner and overnight at hotel in Marrakech. Day 6 - Marrakech: Free day in Marrakech to explore the city and possibly relax at the traditional sauna (hammam) in Hotel in The centre of city and afternon visit free.